Yuketen's flagship moccasin footwear is built in such a way that places a remarkable four layers of vegetable and chrome-tanned leathers and three layers of rubber under foot. 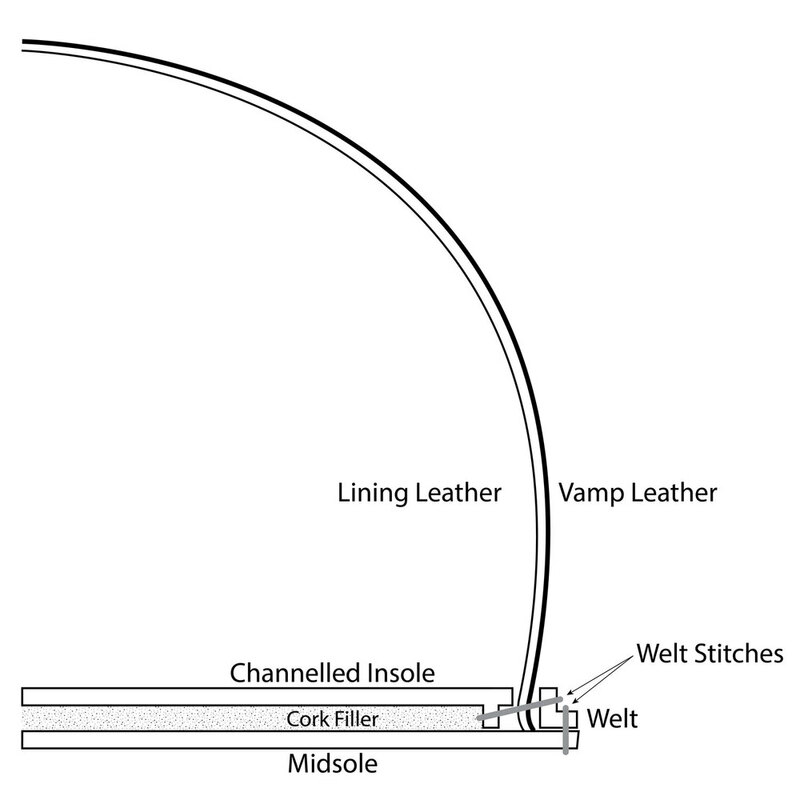 Moccasin shoe construction is unique in that the vamp leather passes underneath the footbed and insole components of the shoe, unlike in Goodyear-welt and stitchdown-construction footwear. This construction method means the foot is totally surrounded by leather and can take full advantage of leather's natural breathability and sweat-wicking quality. The foundation of the Yuketen moccasin is built around a two-layer midsole and a sturdy Vibram outsole. The vegetable-tanned leather midsole is stitched to both the vamp leather and the composition rubber midsole beneath it, for added reinforcement. The composition rubber midsole is then cemented to the rubber outsole. The inner workings of Yuketen's moccasin footwear share several elements with the brands' Goodyear-welt footwear, including the vegetable-tanned leather tuck and steel shank combination in the rear half of the shoe. These two components give the shoe structure where it's needed, but allow the shoe to flex where necessary at the ball of the foot. The curved shape of the tuck and shank also acts as a stable bridge along the arch of the foot, dispersing pressure more evenly across the bottom of the foot and combating fatigue. The foam heel pad provides an additional layer of shock absorption while the full-length vegetable-tanned leather insole gives the wearer an all-leather footbed. Each of the components work in concert to make Yuketen moccasins some of the most comfortable leather shoes on the market and give the moccasins the ability to take to the shape of the wearers' foot with wear, making each pair unique to the owner.